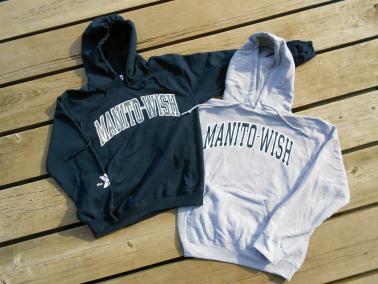 Show your Manito-wish spirit and impeccable sense of style with the classic Manito-wish sweatshirt! Keeps you warm, comfortable and stylin’. Use the hood to escape from paparazzi who heard you went to Manito-wish and want to get your photo. 50/50 preshrunk cotton/poly blend. 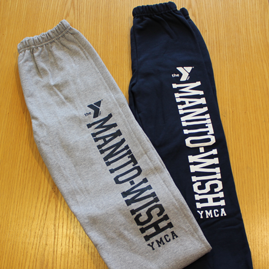 Get up and out or just lounge around in these excellent Manito-wish sweatpants! Actually sweating in them is optional. 55% preshrunk cotton/45% polyester. Everybody needs a little TLC – Trout Lake Circle, of course! 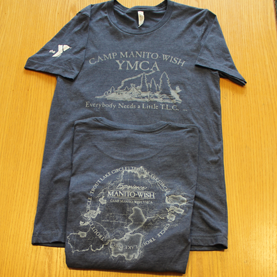 This T-Shirt commemorating one of Manito-wish’s most famous wilderness trips. Wear with pride! Available in youth and adult sizes. 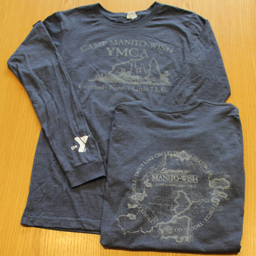 Our Trout Lake Circle T-shirt, specially modified for adults with chronically chilly arms.